The recently completed new energy plant at Canfor's Fort St. John sawmill uses bark and sawdust to heat thermal oil which is used in turn to kiln dry lumber. The new energy plant at Canfor's Fort St. John, B.C., sawmill is a double win, helping to produce higher valued lumber and cut energy costs. When you're talking about bark and sawdust, don't be calling them waste products around Canfor's Fort St. John division. The byproducts of the sawmilling process at the mill/planer complex in northeastern British Columbia are feedstock for a sophisticated new energy plant. The bark and sawdust are used to heat thermal oil which is used in turn to kiln dry lumber. The system is contributing significant savings financially and environmentally while helping to produce a higher valued lumber product. The energy plant has the additional upside of considerable potential for future development and revenue generation. Andy Becker (left), plant manager at Canfor Fort St. John, explains the new set-up has a two burner energy system, each one capable of producing 35 million BTUs. "The reason we went with two smaller boilers was so we could service one while operating the other and we have the flexibility to run them both if markets are there." Del-Tech Manufacturing Inc., is the mastermind behind the energy plant and responsible for its design and fabrication. The plant combines automated efficiency with operational simplicity. "Del-Tech did an excellent job for us and the system is working very well," reports Andy Becker, plant manager at Canfor Fort St. John. Del-Tech is part of the BID Group of Companies, which has operations in Prince George and Vanderhoof. Del-Tech took on the energy plant assignment as a turnkey project. "It was completed on time and on budget and it was done very safely, with zero time loss injuries during the whole process," Becker adds. Canfor operates three wood product manufacturing plants in the Peace River country around Fort St. John. The sawmill is a random length operation producing softwood lumber in 2 x 4 to 2 x 12 dimensions to lengths of 20 feet. Annual production is around 200 million board feet from a log consumption of about 830,000 cubic metres harvested primarily in the Fort St. John Timber Supply Area. A broader tree species mix in the Peace means Fort St. John is not impacted as severely as regions to the south by the mountain pine beetle epidemic. The sawmill's fibre diet runs approximately 60 per cent spruce and 30 per cent lodgepole pine. The mill's products are marketed primarily to Home Depot in the U.S., and has J-grade and low grade lumber markets in China. The considerable deciduous tree component in the region's forests sustains another operation, Peace Valley OSB. 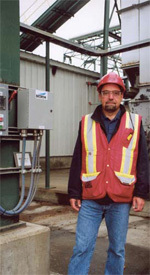 The neighbouring industrial plant is a joint venture between Canfor and Louisiana-Pacific and began operation late in 2005. The third member of Canfor's regional family is a pulp mill at Taylor, about 20 kilometres south, down the Alaska Highway from Fort St. John. The woodlands division at the sawmill manages the fibre supply for all three operations, creating beneficial synergies in the process. The Fort St. John mill did extensive planning in advance of the installation of the new energy system. "In May 2008, we began a separation system between the bark and sawdust we produce at the sawmill," recalls Becker. "They have potentially different end uses." The sawdust, for example, has the potential for re-manufacture into wood pellets to service the growing bioenergy industry. A recently-installed hogging system at the mill has the ability to reduce the size of material surplus to the sawmill's needs for use in the energy system, notes Becker. "We have a two burner energy system, each one capable of producing 35 million BTUs. The reason we went with two smaller boilers was so we could service one while operating the other and we have the flexibility to run them both if markets are there," he explains. The dual system was additionally handy during commissioning of the system, allowing troubleshooting of one boiler at a time. The bark and sawdust byproducts can be used together or separately. 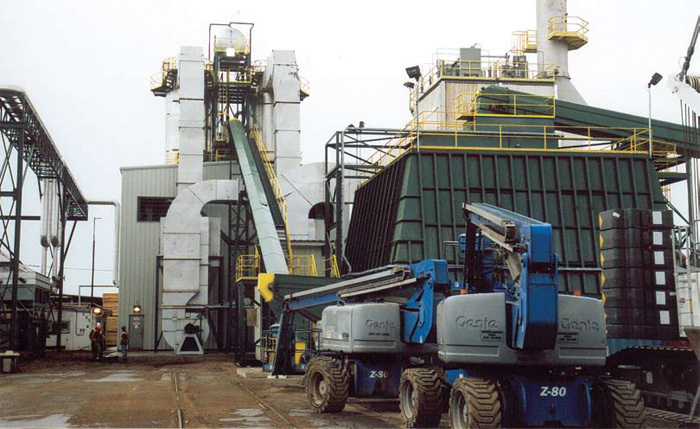 Material from the hog mill can be directed either to a storage bin or into the plant's fuel bin. A walking floor pushes the flow to another conveyor for introduction to the furnace(s). The material delivery to the plant and its handling within it is highly automated and meticulously monitored, says Becker. The feeding of fuel into the furnace is automatically regulated according to demand along a walking floor reciprocating grate, he points out. Fans control the burn rate while probes and variable frequency drives control the fuel feed rate. The high temperature maintained in the furnaces is 230 degrees Celsius. 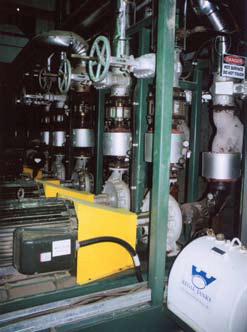 It heats coils filled with thermal oil which is pumped under temperature and volume control to four lumber drying kilns. 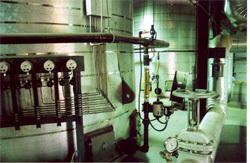 Exhaust gases from the boilers are passed through an electrostatic precipitator. The only other waste product is ash, although potential markets are being investigated for the residue, says Becker. Del-Tech Manufacturing Inc.--part of the BID Group of Companies--was responsible for the energy's plant's design and fabrication. Del-Tech took on the energy plant assignment as a turnkey project. He explains the new system will typically save Canfor from purchasing 250,000 gigajoules of natural gas a year. The energy plant also minimizes the company's carbon footprint. Canfor generates carbon credits through the new system and is actively investigating ways to benefit from them, says Becker. Given that, it's ironic that Fort St. John is located at the heart of B.C. 's oil patch. The importance of the economic driver is reflected throughout the region including every hotel room where a copy of the Canadian Oilfield Service and Supply Directory shares space with the Gideon Bible. Canfor's new energy system, which can be monitored remotely, has more capacity than it currently needs. "We're planning to heat the sawmill building with energy from it," says Becker. "And there are other potential uses for the excess heat." Two of the Fort St. John mill's dry kilns have been comprehensively re-designed to accommodate the new thermal oil heating source and the remaining two were upgraded. Definitive data has not been accumulated--the energy system was relatively new on a recent visit--but preliminary results are encouraging. "We see a lot more consistent drying. The control of moisture in the loads is much better than it was," notes Becker. "There's less warp and twist and with no exhaust gases (in the kiln), the wood is a better looking whiter product after planing," he explains. "From those three things--less twist and warp, lower standard deviation and whiter appearance--we expect a better grade outturn." The new drying system is matched with a Del-Tech PLC kiln control system. It is fully integrated to the in-kiln moisture control system to help optimize the drying process. Del-Tech began active construction work on the energy plant project in September, 2008 and the first fire was lit in a boiler on April 28, 2009. Many staff and contractors contributed to the success of the project, notes Becker. He acknowledges the special contributions of Brian Fehr, Del-Tech's owner; Ben Crooks, the company's project manager, and John Fisher who was Canfor's project manager. Ponsse's Ergo harvester looks to be a good fit with the small, medium and beetle-killed trees in B.C. 's Central Interior. Ontario sawmiller Little John Enterprises has invested $3 million in some significant changes, including making the switch from a circular saw system to band saws. Carroll Enterprises of New Brunswick--no stranger to LogMax heads--is working with the first 7000 Extreme head to be sold in North America, a unit that has met all their performance and production expectations. 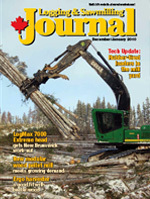 successfully managing a massive log sort operation on Vancouver Island. New modular wood pellet mill in B.C. International, has started marketing a new modular wood pellet mill that can be delivered--and producing pellets--within a six month time frame. Jim Stirling on how forest companies in the British Columbia Interior are re-starting shuttered sawmills in preparation for a brighter tomorrow.